The London Foodie: Duvel & Le Gavroche – Beer and Food Pairing Made in Heaven! Duvel & Le Gavroche – Beer and Food Pairing Made in Heaven! Much as I love wine at meal times (or anytime, come to think of it), sometimes I crave for a long drink with my food. We all know that there are some foods that will go better with beer - pizza, burgers and spicy curries or deep-fried treats are some that spring to mind. I really love good quality beer, but admit to never really considering it as a serious alternative to wine for a gourmet meal. So it was with great curiosity that I recently accepted an invitation to a Duvel Beer Dinner at Le Gavroche. Perhaps unsurprisingly, the food was outstandingly good, but it was the pairing of the four excellent dishes we enjoyed with a selection of Duvel beers that has given me pause for thought. Interestingly, the principles of beer and food pairing are somewhat similar to those that apply to wine. For example, in wine and food pairing, it is a common misconception that fish and white meat will always go with white wines and red meats with red wines. In fact, the trick is not to focus on colour but rather consider the weight or body of the dishes and wines. Similarly, in beer matching, one of the basic principles is “matching strength with strength”. This means that milder dishes will normally go best with delicate beers whilst strongly flavoured foods require more weighty beers. The weight of the beer relates not only to its alcoholic strength, but also to the degree of malt character, bitterness from hops, sweetness and richness. Take our first pairing at Le Gavroche for example – a lovely seared pepper tuna with ginger, chilli and a zingy soy dressing, served with a glass of Liefmans Cuvee Brut 6%. 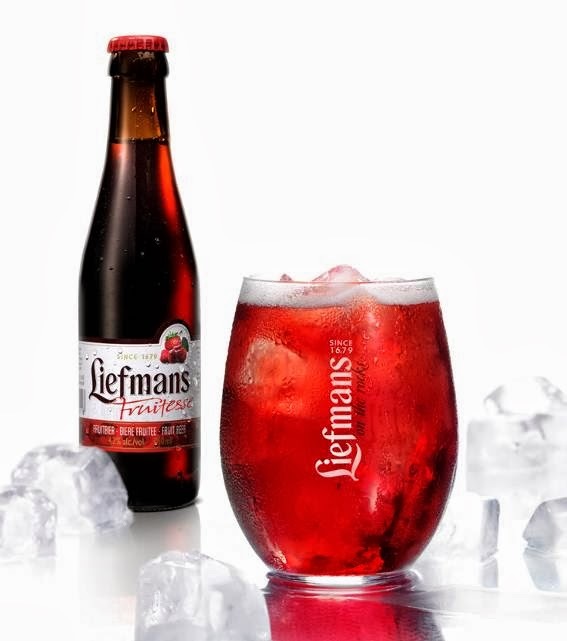 The Liefmans is a deep red fruit beer matured with cherries, which has a rich and refreshing flavour. With sweet and sour undertones, it interacted really well with the pepper and ginger in the tuna. I found it a perfect match that complemented without overpowering the meaty tuna, one of the best pairings of the evening. Another important consideration is the “interaction” of certain qualities between the food and beer being paired, for example, characteristics like sweetness, bitterness and spice, and how these interact with each other. Taking account of these relationships will help to ensure a balanced pairing, with neither partner throwing the match out of sync. Our next pairing was a good illustration of this. 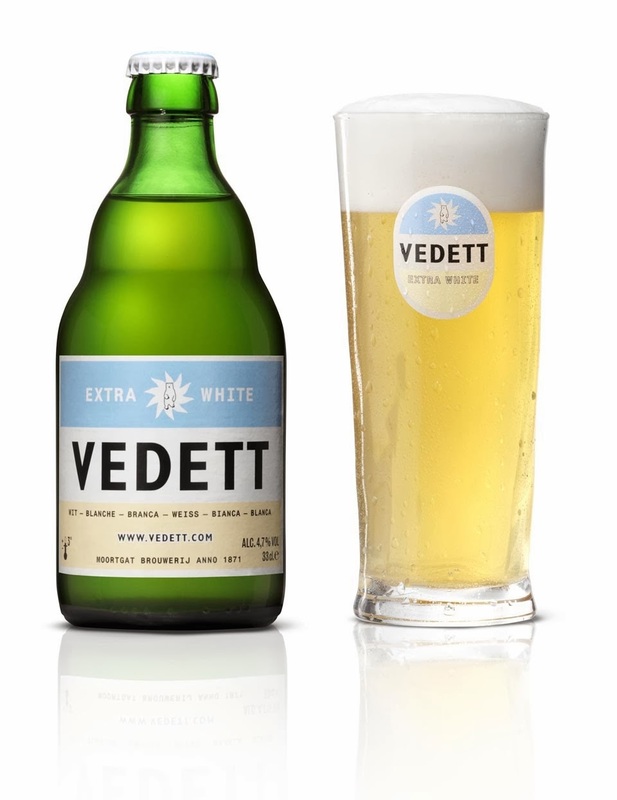 A perfectly roasted cod with a rich mustard butter sauce was served with a glass of Vedett Extra White 4.7%. A wheat beer, this had a delicious, refreshing and surprisingly crisp taste perfect for a fish dish. An orange and lemon zing cut through the richness of the butter while the gentle bitterness from the unfiltered yeast balanced the mustard heat of the sauce. This beer could also make an excellent partner to fish terrines, mussels, prawns and even roast chicken. “Finding harmonies” between food and beer pairings is also key. Combinations often work best when they share some common flavour or aroma elements as we discovered in our next pairing. Racks of pork and cheeks were braised in Duvel beer, making the meat yieldingly tender, sweet and flavoursome. Perhaps logically, the pork was served with the beer in which it had been cooked, a classic Belgian golden ale – Duvel 8.5%. 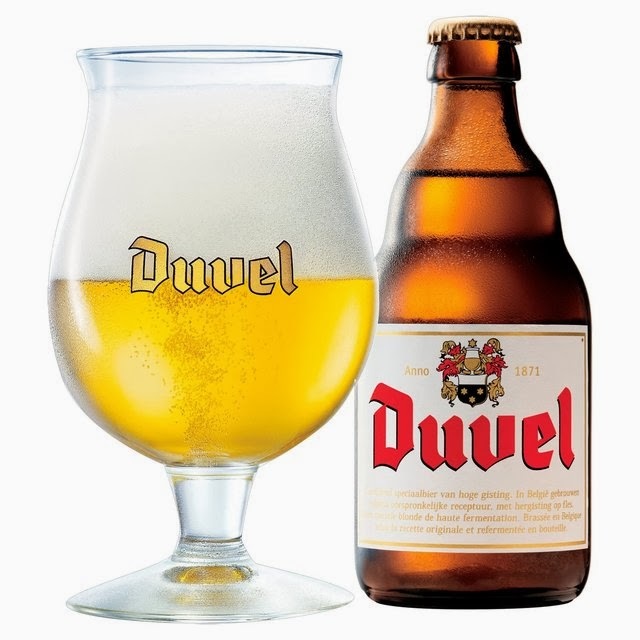 Smooth, lively and almost creamy on the palate, with grapefruit and vanilla notes, Duvel has plenty of body and flavour and can happily fill the shoes of a fuller bodied red wine. Its high alcohol content gives a weight and mild bitterness that was the perfect match for the sweetness of the slow braised pork. For dessert, a Guinness cake with coffee cream and chocolate and malt ice cream was served with a glass or two of LiefmansFruitesse 4.2%. 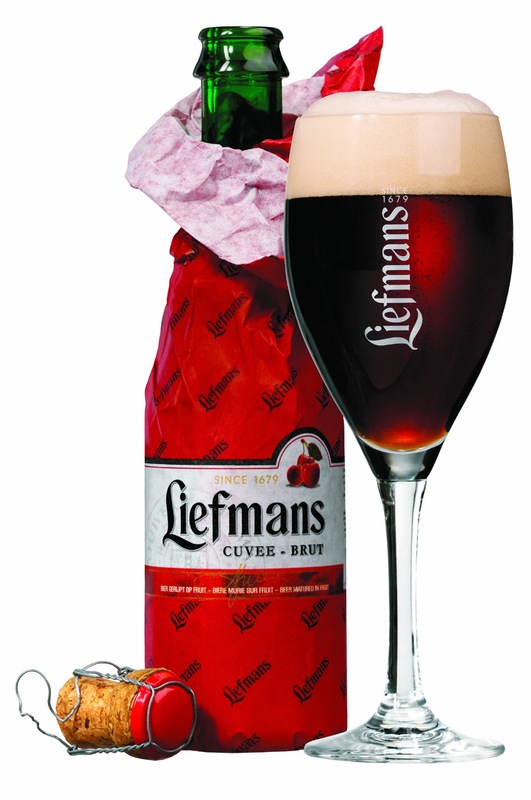 Served over ice, this fresh tasting beer is generously sweet with flavours of red fruits like cherries, raspberries and strawberries which complemented well the chocolate and Guinness elements in this dessert. 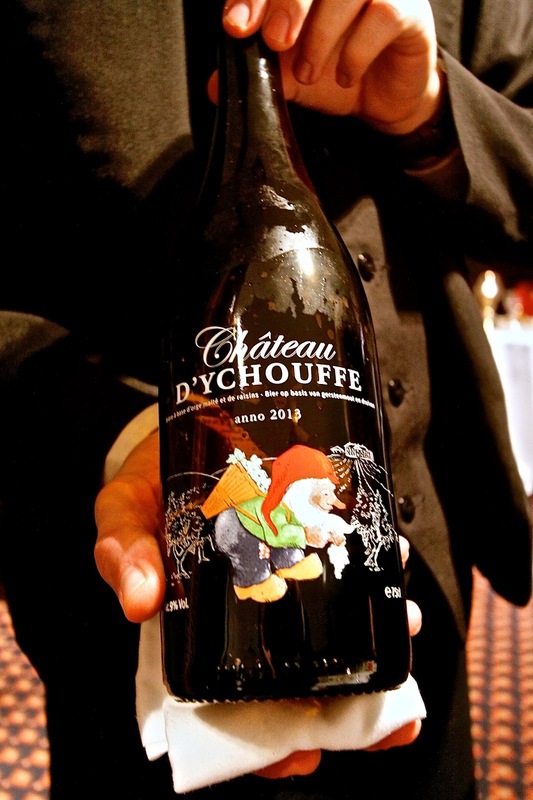 The most unusual of the beers, and probably my favourite of the evening, was Chateau d’Ychouffe 9% (Anno 2013) which was served with our petits fours. The beer is macerated on the skin of sultana grapes which impart a sweetness and wine-like quality I have never come across in a beer. This had enough weight and concentration to go with the delectable selection of nougat, chocolate truffles and macarons and rounded off the evening splendidly. If you would like to take your Belgian beer and food pairing appreciation to yet another level, one last thing to consider is choosing the correct glass for the type of beer. George Riedel, the Austrian manufacturer famous for his range of wine glasses by grape varietal, has now turned his attention to beer glasses introducing three different designs – a flavour-concentrating Pilsner glass, a wheat beer glass and a wide-necked lager glass. For more information about these, visit the Spiegelau website here (http://www.spiegelau.com). A fascinating experience that has opened up a whole new world of food and beer matching possibilities, I look forward to developing this further and bringing it to my day to day and supper club dining experiences. I have to be honest - I rarely drink wine with a meal. I've always preferred beer or lager. And you're right. It's important to match the food with the beer. Although I've not tried it at Le Gavroche yet but I will!